Low light conditions, where a plant gets filtered sun instead of direct sunlight, occur in the shade of trees with wide-spread branches and is called dappled or filtered light. The vines grow under the trees as either short shrubs or as ground covers, filling in a bare spot in the garden that very few plants can. Pandorea (Pandorea jasminoides) is also known as the bower vine, is a member of the bignonia family and a native of Australia. The leaves are evergreen and similar to those of a palm tree with 5 to 9 lance-shaped, 1 to 2-inch long leaflets making up each leaf. The fragrant pink or red tube-shaped flowers bloom from spring though the summer. Plant pandorea in full or filtered sun and a soil that is moist and well drained. The vine is hardy in northern and central Florida. 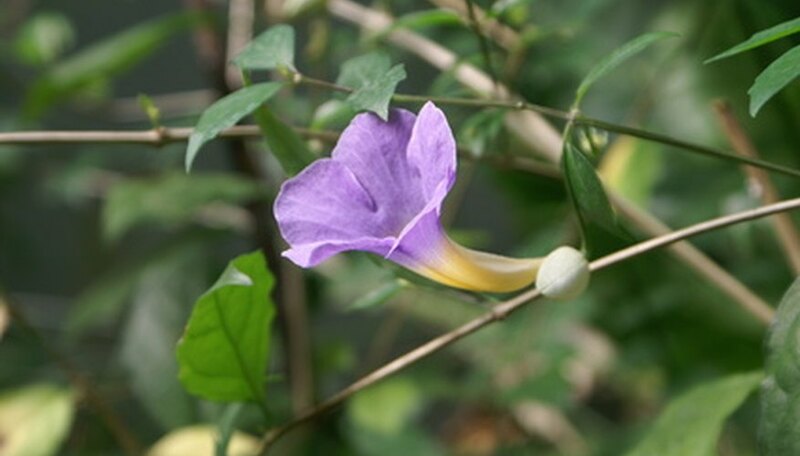 Violet trumpet vine (Clytostoma callistegioides) is also known as painted trumpet and Argentine trumpet vine and is a member of the bignonia family. The vine produces glossy-green, oblong leaves that measure 3 inches long and 1-1/2 inches wide and lavender-colored trumpet shaped flowers that grow up to 3 inches long that are followed by prickly seed pods. Violet trumpet vine is a native of Argentina and Brazil that does well in filtered shade and a soil that is moist to dry. The vine is hardy in all of Florida and the Florida Keys. Scrambling sky flower (Thunbergia battiscombei) is a member of the acanthus family. Without any support, the vine will form a mound that measures 4 feet tall and 6 feet wide. The bright green, heart-shaped leaves grow from 5 to 7 inches long and the blue-purple, trumpet-shaped flowers grow in clusters at the point where the leaves join the stems. Scrambling sky flower is a native of Africa that can grow in any type of light condition and any type of soil as long as it is moist and well drained. The plant is winter hardy in Southern Florida and the Florida Keys. In the rest of the state, it will die off at first frost and come back the next spring. Cape honeysuckle (Tecomaria capensis) is an evergreen member of the bignonia family that grows to 10 feet tall as a shrub and 25 feet long as a vine. The plant produces palm-like leaves that grow up to 6 inches long and are made up of 5 to 7 diamond-shaped, 2-inch long leaflets. Red-orange, 2-inch long, tube shaped flower appear in the fall and last through the winter. The vine is a native of South Africa that does well in light shade and a moist, well-drained soil. Cape honeysuckle is hardy in Central and South Florida and the Florida Keys, blooms almost all year long and is a favorite food source for hummingbirds and orioles.